Fresh back from Legoworld (the 4 day Lego extravaganza at Copenhagen's Bella Center) and let me introduce our new 'friend', Olivia.... This young lady is one of a range making up Lego's new line of figures, Friends, (that come packaged together with the lifestyle accoutrements of a dream house, wardrobe, ice cream parlours, shops, tree houses etc etc) due to hit the shelves here in Denmark later this month. Well, they're making quite an entrance, these little girls, in their pink and purple boxes. As a mother of both a boy and a girl, I have a couple of years of experience at observing play and seeing the different paths of development that each of my children is following. 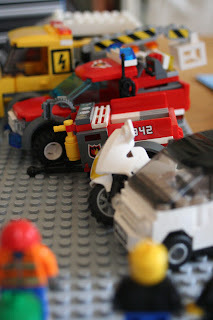 My son, a long time before he could say the word Lego, developed a fascination with cars, trucks, trains, police vehicles, fire engines and the like. I don't think that I ever steered him in this direction and the fact that my daughter, born into a playroom full of vehicles and train tracks but sometimes preferring to carry my handbag and dress up in my clothes, leads me to conclude that nature rather than nurture plays an important role. For my son, and his love of all vehicles, Lego was the obvious choice of toy so he could build and rebuild his own selection of transportation. Incidental to all this, he enjoys creative and independent play, hones fine motor skills and learns about concentration. Until he started school last year, he was not at all keen to sit down with a pen or a paint brush. He naturally leaned towards construction. I think this is different for girls. My daughter is not yet two years old and yet she already likes (and can confidently hold) pens and pencils. My amateur opinion is that the skills that my son is developing through Lego, his sister may develop through arts and crafts: different but parallel paths of development. Obviously, these are not set in stone and each child finds their own way. So, why is Lego being raked over the coals? 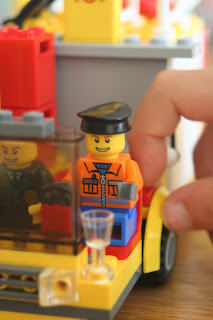 The 'problem' appears to have started with the Lego kits for trucks, trains, rockets, aeroplanes and emergency rescue vehicles etc, which have created a world of creative play for boys from the age of 4ish; now known as the 'Lego phase'. These kits don't appeal to girls because, as research apparently shows, while the boys are playing with their plastic colourful bricks, the girls of the same age are into the 'princess phase'. For them, its still about the imagination and building a fantasy world but one inhabited by different people (princesses rather than firemen etc) and with a different colour palette. It took four years of research but Lego has discovered that girls today do like construction but in a different way to boys. Lego's answer? The 'Friends' range in its pink and purple hues. As an aside, I'm slightly sceptical about the supposed colour palette of play. 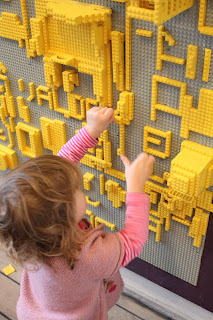 A visit to the Lego play area at Louisiana Museum for Modern Art (just north of Copenhagen) where all the bricks are yellow takes care of that theory. Both girls and boys enjoy creative play when the toy is stripped down to its most basic. The real problem lies in what is going on in the lives of today's little girls - how did they find themselves in the pink and fluffy 'princess phase'? 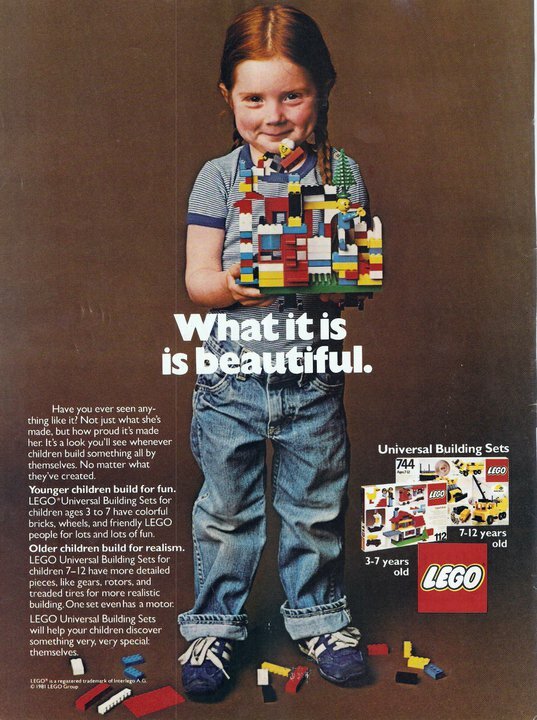 The above Lego campaign comes from 1981 - there's only a hint of gender based marketing but it is far from stereotypical and speaks volumes about what has happened over the last 31 years. 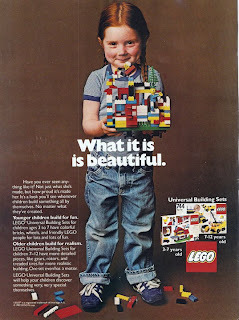 The multicoloured creation the little red head girl holds is what I remember about playing with Lego in my own childhood. I didn't need Lego bricks to be pink or mini figures to be little girls to recreate the world of my imagination. Lego didn't create the 'princess phase' so can we really blame them for simply responding to it? The 'friends' figures are fully compatible with the other Lego ranges. Can't the Lego phase and the princess phase co-exist in harmony? Ultimately, if it is agreed that Lego is good for children then isn't it better that both girls and boys have an opportunity to enjoy it? If girls are missing out on developmental skills because they don't want to play with Lego trucks, dragons and ninjas, here's a clever way to make it attractive to them: princess meets astronaut. Perhaps then the minds of little girls will entertain dreams of space travel? Who knows? For my part, I'm looking forward to showing Olivia around the neighbourhood. Good luck Lego!